SO, I thought it would be neat to share a lovely laundry room we just put the finishing touches on this week— just in time for my dear client to enjoy it as her children and grandchildren arrive from out of town for the holidays! It was a long narrow space with the laundry room at one end that had always felt cramped and clunky to my client—but I had a feeling we could switch things around to make things feel brighter and more spacious. ALWAYS a good thing! To create more space, we took the powder room and moved it to the end of the hallway—- and moved the machines to the area where the back door used to be (there is another door nearby that made this possible). Switching the door opening to a double window was an update that gives more light over the washer and dryer, and a beautiful view of the backyard. At the other end of the hall, we bumped one wall out just a couple of feet, borrowing unused space in the adjacent garage to allow room for a bench—perfect for taking off muddy boots or tying little one’s shoes. 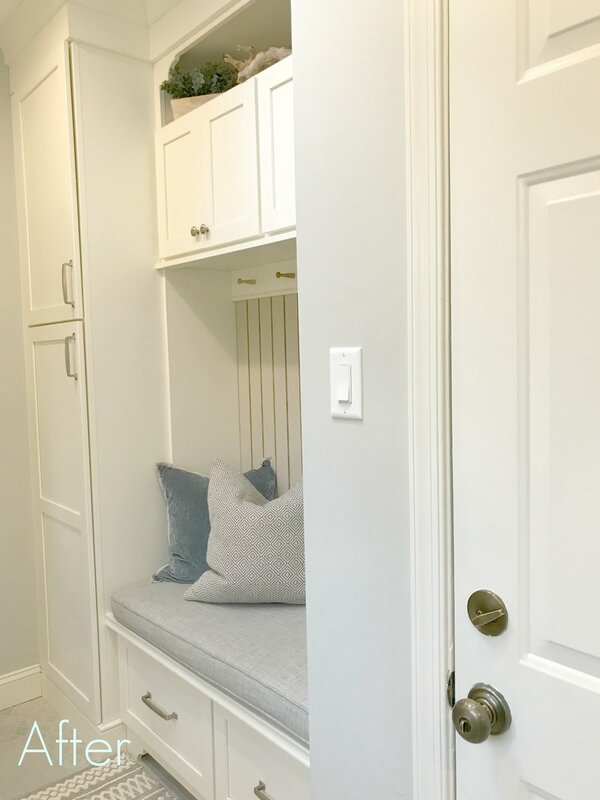 Opposite the bench is a functional and beautiful run of cabinets and countertop, providing much needed storage and counter space for folding all those sparkling clean clothes. A funky salvaged door hung barn-style (taking away all that pesky door swing that used to eat up so much space) and the fun multi-patterned tile floor are two favorite details that add so much personality. Here’s to a crisp, clean-slate of a new year, with space for each of us to create all that we dream of.